A few weeks ago we threw my son Henrik a super hero party. I thought it would be fun for the kids to feel like they were real super heroes flying through the sky saving lives, so we created a city scene photo booth. At first the kids didn’t understand why they needed to lay on the ground with their arms stretched out and their feet pointed. Once they saw the pictures they understood they were more willing to oblige and started getting into it. The adults at the party had so much fun watching the kids strike their different super hero poses. 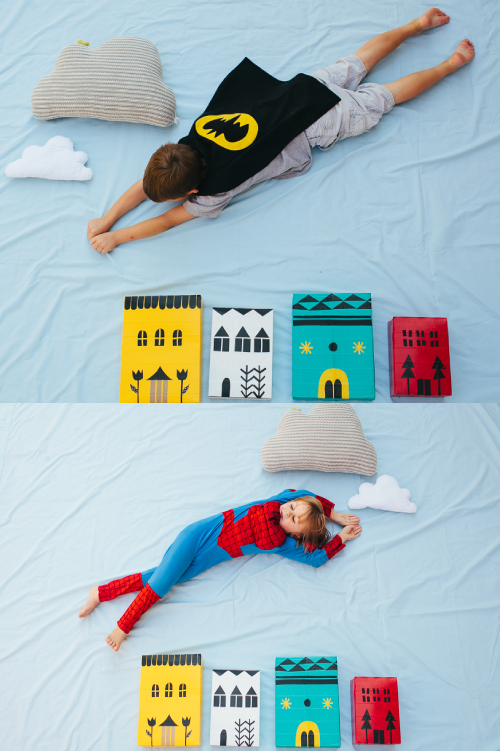 To make the city scene all you need is an old blue sheet, a ladder, a cloud pillow or two, buildings made out of cereal boxes and duct tape, and of course a willing super hero with a cape and mask. For the buildings I enlisted the help of my good friend Merrilee who among her many talents is something of a duct tape genius. I saw this idea originally many years ago in a craft book and unfortunately I can’t remember the name of the book, maybe someone can help me out? Or go to our website http://www.littlepuggle.com. Wow, what an amazing idea – the pictures look so great. These would look SO COOL on a PrintArtKids custom notepad or notecard! 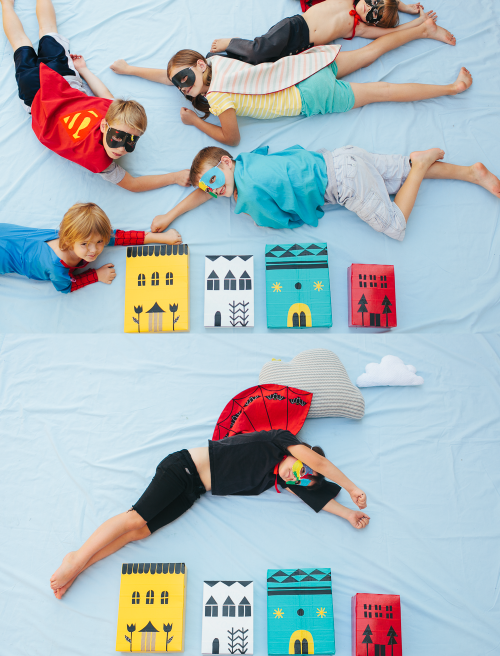 Your own personal Super Hero stationery! Meta! you are just amazing! this is incredible. So much fun! and the pictures… and the idea!!!! too much fun! congrats Meta!